Carrot sticks are a bit of a staple in our house, along with cherry tomatoes and cucumber batons. But much as we like them all, we’re yearning for a bit of raw veg variety. So, following last year’s success, we’re growing mangetout again. The translation from the French is “mange” = eat and “tout” = all. Which perfectly describes these pods which are harvested before swelling with peas, and the crunchy pods are eaten in their entirety. 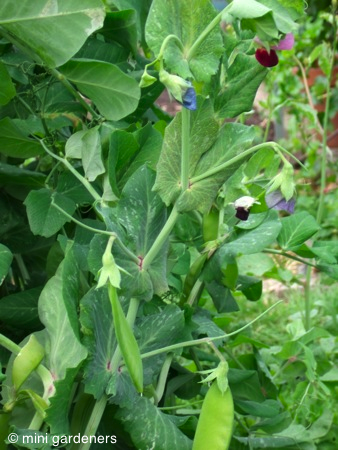 All made possible because the mangetout pods have thinner walls and are much sweeter than regular pea pods. We’re growing a heritage type of mangetout called ‘Carouby de Maussane’ which has very pretty purple flowers rather than the usual white. In fact, it wouldn’t look out of place in a flower border. We sowed our first seeds under cover and have just planted the seedlings out. But you can still sow until the end of May and the soil is warm enough now to sow direct, so we may pop some extra seeds into the ground for a second crop. The plants grow to about 1.5m tall so they need something to climb up. We’ve gone for the standard wigwam of bamboo sticks and string; not hugely attractive but functional and it’ll soon be covered anyway.